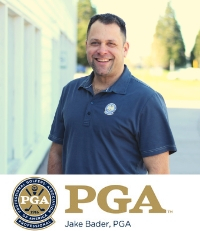 Jake Bader is the Professional Golf Instructor at Colwood Golf Center certifified by the Professional Golf Association (PGA). Throughout the years and over 18,000 lessons taught Jake has had more than 45 juniors go on to play collegiately, 13 club champions and over 100 tournament wins. Jake believes in coaching to each students own individual goals and utilize the teaching method in which will work best per individual. Jake takes a comprehensive approach with his 5 star instructional program. Contact Jake Bader to book your lesson today!